Aspiring to have beautiful, healthy skin is not purely because of vanity. After all, the skin is the largest organ of the body. Caring for it is as essential as caring for other vital parts of your body. It's not surprising then that like many people, Filipinos are constantly on the lookout for products that will not only pamper but also protect their skin. But truth be told, skin products don't come cheap. Especially those imported ones which one usually sees on glossy fashion magazines? They will burn a hole in your pocket, that's for sure. Thankfully, United Laboratories (Unilab), one of the country's top pharmaceutical firms, ventured into creating a skin care product line called Celeteque Dermo. Celebrating its 10th year in the industry, Celeteque Dermo has created customized skin care solutions for every type of skin. Throughout the years, it has come up with innovative products that uses the latest derma-grade ingredients and technologies. Needless to say,all these products have undergone clinical tests and research, and have been proven safe and effective for everyday use. Celeteque's lineup of products include Celeteque's DermoScience line, which cater to specific needs of the skin. There are products focused on Acne Solutions, Advanced Anti-Aging, Brightening, Sun Care, and even Hair and Scalp Care. Because of its high quality products, combined with reasonable price points, Celeteque's DermoScience line had gained a loyal following even among beauty experts. Celeteque Dermo has taken it a step further by developing a line called Celeteque DermoCosmetics, which combines makeup with the nourishing benefits of skin care. Isn't it great to have a line of cosmetics that will not only enhance one's innate beauty but promote healthy skin as well? 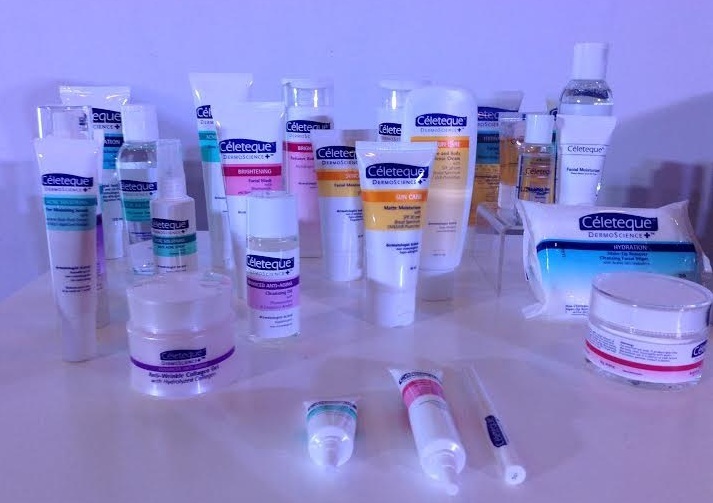 With Unilab's pharmaceutical expertise, expect more excellent Celeteque Dermo skincare products in the years to come. Want to feel DermoBeautiful? Try out some Celeteque Dermo products and see how your skin becomes healthier and smoother. All products are available in leading drugstores, cosmetics shops, and malls nationwide.